The National Reading Panel states that reading comprehension is the "essence of reading." Comprehension is critically important in the development of children's reading skills and therefore the ability to obtain an education. Initially, children understand only the literal meaning of what is read to them. Higher thinking skills and more complex comprehension develop and grow the more children are read to. Discuss what is going on in the stories you read aloud. Talk about abstract ideas such as feelings; make predictions and inferences. Read the title, look at the cover illustration and ask your child to predict what the book is all about. Read the first page or two and ask what might happen next. When you have read half or more of the book, ask your child how he thinks the story will end. Good readers do more than just figure out letters and words. They think about the meaning of what they read. Good readers talk to themselves while they are reading and ask questions when they are confused about what is happening in a book. They make predictions about the story based on the cover and are interested in discussing the story and characters. Read five books from the "Counting" book list. Go to the Library and check out something you've never tried before: a magazine, a Read-Along book, a Big Book or an Early Literacy Kit. Cover each day of this month with a penny. Count the total number of pennies. Arrange them into groups of five. Then groups of ten. Explain that 5 pennies= 1 nickel and that 1- pennies= 1 dime. 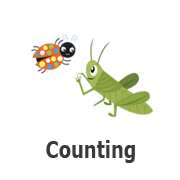 Practice counting with your child. Have them count everything. “How many pieces of chicken do you have?” “How many spoons are in the drawer?” Many preschool children can count to 30 and visually understand written numbers 1-20. This means that they can link the number of objects to the numeral (counting one to one correspondence).